I love all the fresh, organic sweet corn I’ve been getting in the CSA lately, but I was in search of a new way to eat it. 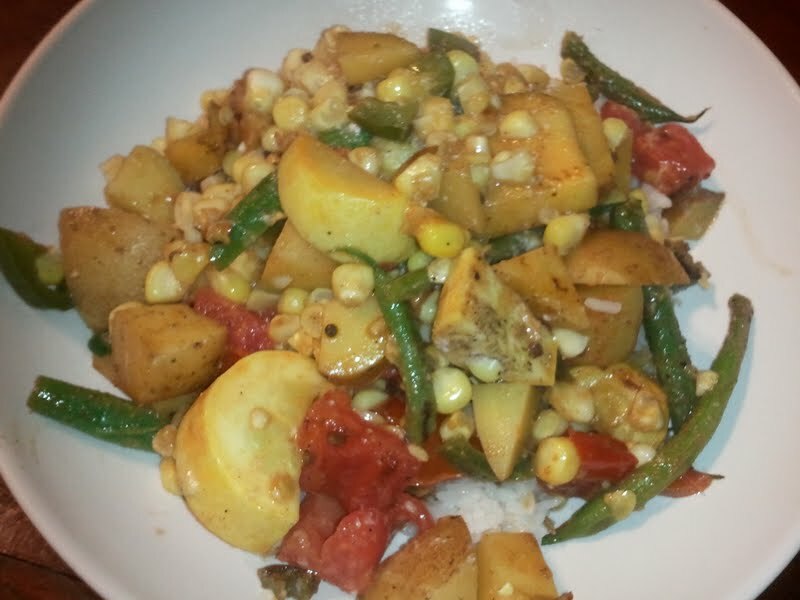 I stumbled across this recipe from Serious Eats requiring corn (check) tomatoes (check) and potatoes (check)a and written by the vegetarian-savvy Madhur Jaffrey. I added a few vegetables of my own – summer squash and green beans – as well as some black pepper, and used two very potent jalapenos. Sadly, I had no cilantro or mint, but I added coriander and I think that with the extra spicy kick, the dish didn’t suffer. Result – delicious, and totally unexpected. I can’t wait to eat the leftovers. I love vegetable curry. They’re much better than those which use chicken simply because the vegetables actually add to the dish. They aren’t there simply to fill one up.